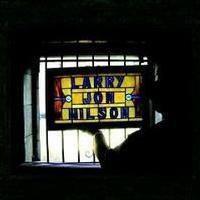 Over a period of seven days in June 2007, the songs for the album Larry Jon Wilson were recorded on the fifth floor of the Mirabella on Perdido Key, Florida in what could best be described as a very loose setting. Larry Jon would tell stories to Jeb Loy Nichols and Jerry DeCicca about "hitch-hiking, hustling pool, being a father, gambling, drinking, women and the friendships with Townes Van Zandt and Mickey Newbury" and jump into songs, so it's all live in the studio/condo and all first takes. Jake Housh just pressed the record button when a story turned into a song - and thanks to Larry Jon, these men, James Endeacott, 1965 Records and Drag City, the world finally has the fifth Larry Jon Wilson long player - a collection of personal songs connected, not only by great lyrics, always soulful performances and the puristic arrangement (none), but by Larry Jon's warm heartedness, compassion and 68 years of wisdom.